BitDefender Total Security 2017 is one-stop software that combines the duties of three different software into one single software. The software is works perfectly on Windows, Mac OS and Android operating systems. The software has been re-designed and upgraded from the 2016 version to provide a full protection against all forms of malware, and across all platforms. With the most advance security technology alongside the most flexible and intuitive user interface, this software is simple enough to be deployed. You need a single account to install this software on as much as 10 devices, however, prices get higher depending on how many devices you want to secure. 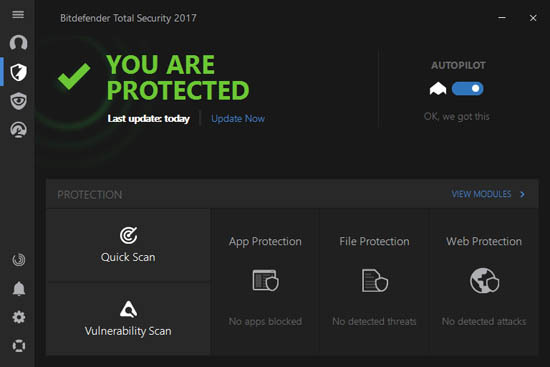 For 5 years on a row, BitDefender has remained on top of the ranks, when it comes to internet security, BitDefender Total Security 2017 comes with an artificial intelligence feature that ensures that it reacts swiftly to the detection of any malicious content, it is a 3-in-1 software that provides maximum security at the best price bargain. The Wi-Fi advisor feature on the software ensures that you are completely safe, especially when using financial apps or any other third party app that can be easily infiltrated by hackers. The Wi-Fi security advisor protects you whether you are accessing a WiFi internet at the cafe, airport, public library, parks or Hotels. The Wi-Fi advisor protects you against Data snooping and other vulnerabilities. McAfee Total Protection 2017 is a premium anti-virus software for the maximum privacy and identity protection on your device. It can be installed on PCs, smartphones, and tablets with one single subscription. This software has received numerous awards based on the performance tests conducted on its effectiveness. It protects your device against dangerous downloads and also from surfing harmful websites. Regardless of the Wi-Fi connectivity you use, BitDefender Total Security 2017 will re-configure the working mechanism, to suit the current demand in order to provide the best maximum protection against threats. Ransomware is one of the most dangerous Malware that can affect your device, once it gains access, it destroys key files, and encrypt them until those files become useless, and you may have to spend lots of money to get such files decrypted, especially if they are sensitive. BitDefender Total Security 2017 has a 5-star rating, when it comes to blocking ransomware. 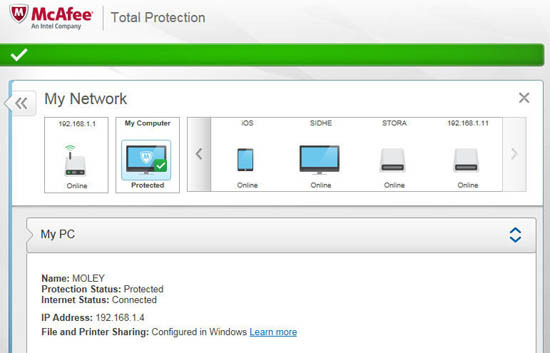 McAfee Total Protection 2017 comes with an easy-to-use webpage that makes it much easier to control every aspect of your device protection from one single point. You can create up to 5 user accounts even on a single device, and it helps in securing your personal files through a combination of encryption and passwords. The software can log you unto apps and websites with one single touch.